The bogeyman lives under the bed, ghosts tiptoe from the darkness. There are many children with a vivid imagination who are afraid of the dark. "Some members of our design team had personal experience of children with the fear of the dark but we couldn't find a good solution for it. Many families are affected by night terrors, so we wanted to see if we could find a something that would work. A nightlight wasn't the idea that we came up with first, but after some tests by people affected by the issue, we decided to develop it further. Light makes you feel safe," says Heini Salovuori, head of business development at LeeLuu, the company that produces soft interactive nightlights. The first prototypes of the soft nightlight were produced in 2013. "We have been working with families since we started; first with children and later with their parents as well. The first nightlight design appealed more to adults as it was quite functional. During the design process, we decided to make the design more suitable for children; it had to be simple and suitable for certain types of interior." Three animal figures emerged: cat, owl and hedgehog. The four-strong founding team have learnt a lot about smart textiles over the process. Yet it was the users, i.e. children, who came up with the idea of how the light should be switched on. "We have gathered numerous ideas and user experiences through various channels, for example at workshops arranged for families, and we are still eager to receive feedback. Our design team holds meetings to discuss ideas and to explore what is behind the ideas; they want to find the problem and the solution." Sometimes it can be difficult to find the point among a multitude of ideas. "Our decisions are based on expertise, experience and saleability. We develop a solution, which we then take to users and collect their feedback. The creation of the nightlight required a good few rounds of prototypes." A lot of planning goes into a product, and every decision has to be well justified. The best products are usually very simple even though simplicity can be difficult to achieve, but working with children is always easy. "Children say what they think, which makes our job easier. They give unfiltered feedback, both positive and negative, and they don't worry about hurting adults' feelings. That kind of feedback is vital." LeeLuu launched a crowdfunding campaign to get production started on the nightlight, and thanks to the campaign, the first cats, owls and hedgehogs will be snuggled with children in December 2016. Orders have arrived from 31 countries, mainly from Finland. "The reception has been great. The product is approachable, charming and lovable, even. Touching, hugging and stroking the toy is comforting." LeeLuu is making toys from smart textiles for the first time and though there may be some challenges ahead, everything has so far worked according to plan. But where could wearable technology and textile sensors take us – and LeeLuu – in future? 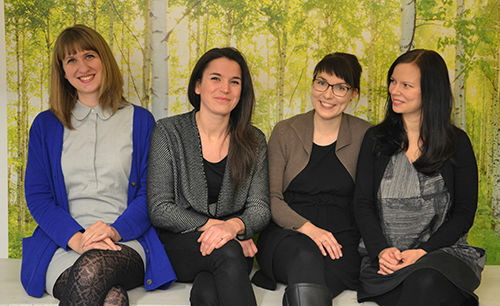 While the team members, Heini Salovuori, Emmi Pouta, Hanna Markgren and Lisa Gerkens, were designing a soft touch user interface, they developed a textile sensor that they patented, with an innovative sensor structure. However, this sensor was not used in the nightlight. "We love exploring the ways that products can be used. We may rely less on screens as interfaces in future as soft user interfaces may well replace them. The possibilities are endless when we start integrating electronic components into textiles in our environment. LeeLuu wants to join the bigger trend where digital features are an inseparable part of our everyday life. There are already numerous applications that could be controlled using our user interface." LeeLuu's office is located in Design Factory in Otaniemi, where it is surrounded by other startups. Otaniemi has turned out to be the ideal location for LeeLuu. Unlike many other startups that only operate online, a team such as LeeLuu's needs actual premises for their product development activities. The network of companies encourages people to share information and support each other. "We first started in an accelerator programme at Startup Sauna and then moved to Design Factory. We have also received support from Spinno and we work closely with Aalto University. We all learn from each other as the startups here are in different stages; some have only started while others are more established. Our development has really benefitted from having gained new insight from different people. We don't compete with each other. There's always a helping hand if you need one. Open up, and you're likely to get to know new people."